Lucky Dog Daycare and Boarding is ready and wanting to provide your dog with the best experience in play and boarding. Located in Lisle, Illinois, we serve the surrounding areas such as Naperville, Downer's Grove, Wheaton, Westmont and Warrenville. We have 5,000 square feet of fun and comfort. Our facility features large play arenas, air conditioning throughout, large outdoor dog run, rubber floors, and a staff with red cross and other industry accreditations. There may be bigger facilities, but the owners at Lucky Dog have kept their eyes on the desire to be the best. Over 5,000 square feet of indoor and outdoor play areas. Call today for an evaluation appointment (a $20 fee applies). Only pre-approved dogs will be accepted. All dogs must be current with all shots and vaccinations. Please provide copies from their vet. "Our dog Bella looks forward to her 1-2 days per week she spends at Lucky Dog. Day care continues to be an excellent way to let her burn off her puppy energy, in a safe, fun way while her pet parents are at work!" - Jennifer and Gary C.
"My husband and I both work full time jobs. We didn't think it was fair to make her sit at home for 10 hours until we got home. Lucky Dog has allowed all three of us to have the best of both worlds. We get to have the companionship and unconditional love of a dog and Penny gets to play all day and then come home to a family that adores her. The owners and staff are well versed in dog behavior. When I pick Penny up they are more than willing to provide honest feedback about how Penny conducts herself with other dogs and humans. It's truly a place for Lucky Dogs!" - Amy and Paul G.
"Talk about a Lucky Dog (or dogs in our case). Harper and Deacon have become a Lucky Dog success story. Having 2 high- energy puppies (Dobermans) that need massive amounts of stimulation and exercise, and 2 parents who work…What to do? We enrolled our furry "children" in Lucky Dogs daycare program 3-4 days a week and saw dramatic change in their behavior for the good. The puppies no longer fought with each other, were much calmer around the house and more social with everyone and everything all around. Dog training classes are also offered on site and proved to be both convenient and extremely useful. 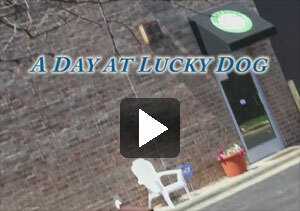 Give Lucky Dog a chance, and make your dog one of the "lucky ones." Say Hello to Sonny, one of our oldest and most loved Lucky Dog Member. Sonny has been with us since the early days at LD. He’s a 13 year old golden. Sonny is not as active as he used to be, and just can’t play like the old days. So, we made him the “House Dog”. Sonny has free access to the grooming room and kennel area, where he helps Corinne groom and helps the wranglers clean. We keep him busy and he keeps us happy! We love it when he comes to visit. 11:30 am – 1:30 pm. No Visitors.